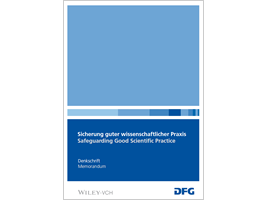 White Paper "Safeguarding Good Scientific Practice"
The DFG recommendations for safeguarding good scientific practice, published in 1998, were used by the research community to initiate and formulate a system of self-regulation that found a general consensus. A comprehensive system of self-regulation was set up in every registered research institution based on these recommendations. An amendment and update to the recommendations was approved by the DFG's General Assembly on 3 July 2013. To whom do I turn with questions regarding good scientific practice, or in the case of suspected scientific misconduct? What does a typical investigation look like in such cases of suspicion? And what consequences can it have? These and other questions are answered in the process guideline, which draws on the wide experience of the DFG and its Head Office in dealing with instances of suspected scientific misconduct in the past. 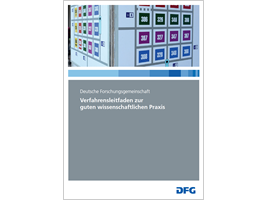 The two documents mentioned above can be ordered from the DFG Press and Public Relations office, Michael Hönscheid (0228 885-2109 or Link auf E-Mailpresse@dfg.de).